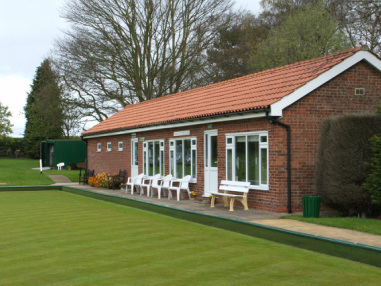 Walkington Bowling Club was formed on 31 January 1977 on land leased from the Sherwood Charity. Funds to complete the laying of the green were provided by the Playing Field committee. In 1977 the annual fees to play bowls were £6 per person. Funds for subsequent work to build the original clubhouse and two further extensions were raised through the Playing Field committee and the Bowling Club committee. More recently, new equipment stores have been installed and the upper sections of the concrete driveway have been relaid to improve access to the main car-parking area. We have one of the best greens in the County, which was recognised in 2017 by the club being selected to host the final rounds of some Yorkshire competions. This year, 2019, the fees are £68 per playing member. Monday and Thursday afternoons unless the green is needed for outside competitions. Please arrive before 1.45 so that play can start promptly at 2pm. In addition to pre-advertised dates there are several 'Roll-up with sausage-roll supper' evenings on Saturdays throughout the season.